Sounds specifically chosen to wake child. Single tone (red,green, orange or 8-tone (yellow or camouflage) options available. 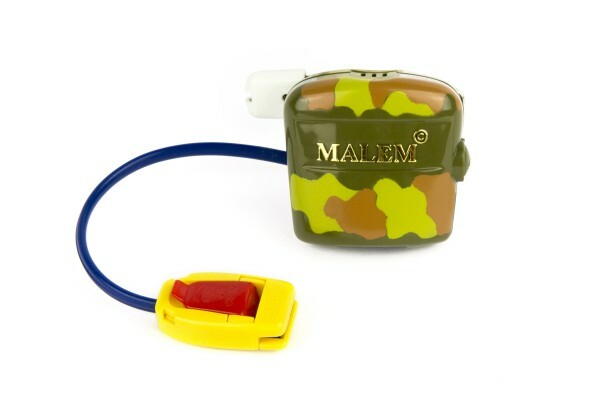 Easy-clip sensor or a Malem Standard Sensor included with this alarm. A Malem Bed Mat Sensor can be used if preferred. Batteries included plus one spare set of 3X 1.5V alkaline “button” style batteries. Comes with a free Malem progress chart allowing you to track the progress being made towards becoming dry. Care Instructions. Clean sensor with soapy water and small toothbrush once a week to remove urine residue.